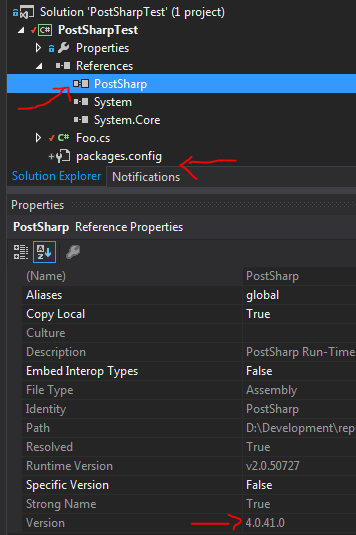 You can disable the automatic reference fixing of PostSharp by going to menu PostSharp / Options / Advanced and check the option „Disable NuGet dependency verification before build“. Nope, I tried that before my post. Not working since PostSharp is not activated in the project. Paket downloads the NuGet package and adds the DLL to the project. csproj is attached below. So thats the reason why PostSharp works with projects that have had initially configured by NuGet. 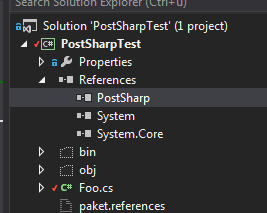 New projects only get the references but not the configuration to use PostSharp while compiling. What do I have to write in the csproj to activate that? This project won’t compile because tools\PostSharp.targets is not imported. It’s currently added by install.ps1. If you add this Import it should work. Ah, thanks. This feature is gonna removed from NuGet. Till then I can execute this manually.